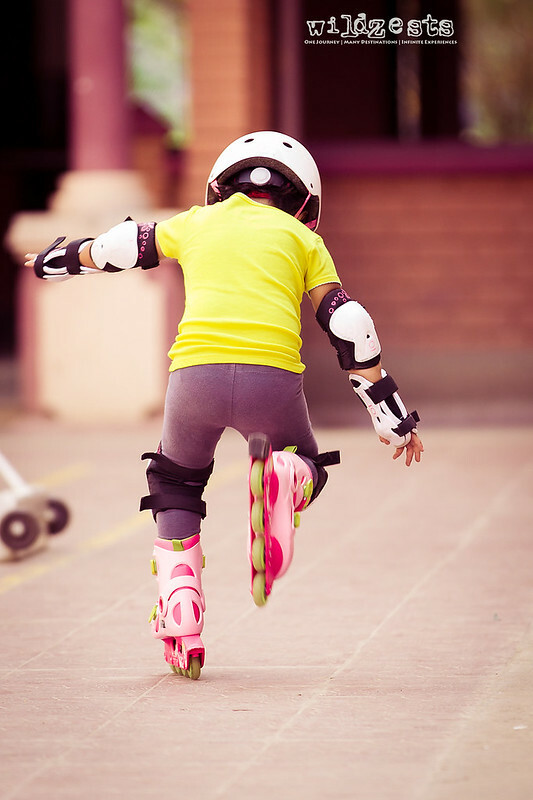 WildZests: Life Skill #2: Roller blading is fun! 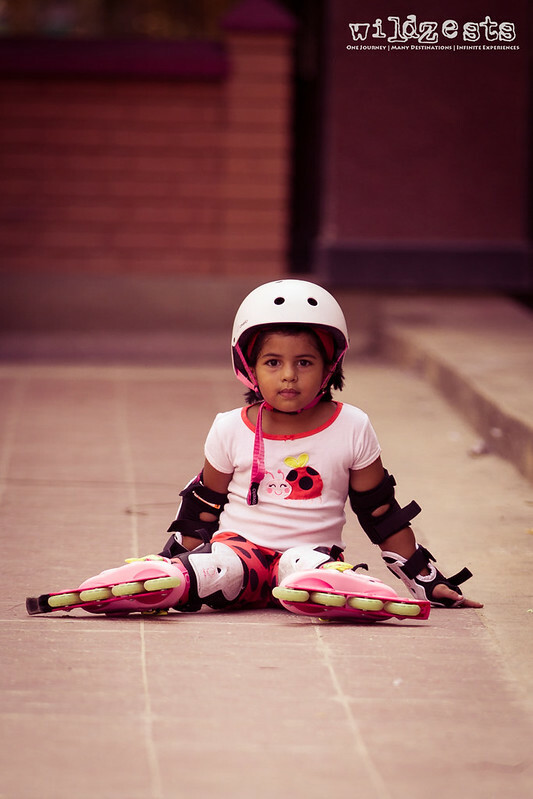 With the cycling skill already in her box, Pozu had now set her eyes on roller blades. There are quite a few kids in our apartment complex who come out with their kits to practice and it's fascinating to see them roll past in style. Wonder how we grew up without all of this and never really missed it! Now I had no prior experience of skating or roller blading, so I had very little to offer in terms of advise. All I could do was read up a few techniques on the internet and ask her to implement those. So to begin with, I chose to let her try on her own and not really influence her process of self-learning. To my surprise, it took her less than a couple of minutes to get on her feet and stand without any support. She was now ready for her first attempt to roll, and I was left amazed by the way she did it! There was no sense of fear in her, it was infact a cake walk. Soon she was striding around on those wheels trying out various techniques that could help her propel faster. This is where I could use some of my academic knowledge about skating techniques and help her learn how to position her body and let it flow in a rhythm. It wasn't more than a couple of practice sessions that she could navigate herself and also stop when required (although the stopping part is still a bit random even now!). In the process of learning, she fell quite a few times, actually a lot more than when she learnt to cycle. Some of the falls seemed harmless and some were a bit scary, luckily she never got hurt because of all the protective gear she wears. But she's never had an element of doubt on whether she wanted to continue or not, she just shrugged it off and moved on. That's what makes her so amazing!